7 Awesome Stats from NFL Week 7 - Fantasy Football, Fantasy Football Rankings | Mac Bros.
Week 7 of the NFL season has nearly come and gone. Let's look back at 7 feats of statistical awesomeness. 1. Green Bay quarterback AARON RODGERS passed for 335 yards with three touchdowns and a 146.5 passer rating in the Packers’ win. Rodgers is the first player in NFL history with a 110+ passer rating in each of his first seven games to start a season. 2. The NEW YORK JETS overcame a 21-10 deficit to defeat the San Diego Chargers 27-21 and the DENVER BRONCOS erased a 15-0 fourth quarter deficit to defeat the Miami Dolphins 18-15 in overtime. It marked the 21st time this season that a team trailed by at least 10 points and came back to win the game. That is the second-most through the first seven weeks of any season in NFL history (23 in 1987). The Broncos also became the first team to come-from-behind and win a game after trailing by 15+ points with three minutes remaining in the fourth quarter since 1970. 3. 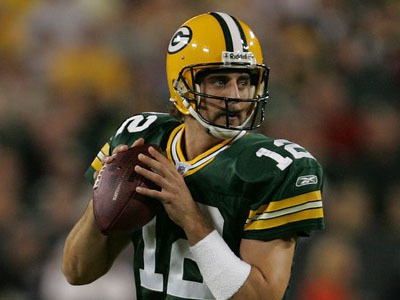 The GREEN BAY PACKERS defeated the Minnesota Vikings 33-27 and improved to 7-0. The Packers are the fourth defending Super Bowl champion to start the following season 7-0 (1990 San Francisco 49ers; 1998 Denver Broncos; 2007 Indianapolis Colts). 4. Atlanta tight end TONY GONZALEZ had five receptions for 62 yards in the Falcons’ 23-16 win at Detroit. Gonzalez now has 1,104 catches and passed CRIS CARTER (1,101) and MARVIN HARRISON (1,102) for the second-most receptions in NFL history. Pro Football Hall of Famer JERRY RICE (1,549) holds the record. 5. Dallas Cowboys rookie running back DE MARCO MURRAY rushed for a franchise-record 253 yards with one touchdown in the Cowboys’ 34-7 win over St. Louis. Murray’s 253 rushing yards are the second-most rushing yards in a game by a rookie in NFL history. Minnesota running back ADRIAN PETERSON holds the rookie and all-time record (296 on November 4, 2007). 6. Carolina rookie quarterback CAM NEWTON had a passing and rushing touchdown in the Panthers’ 33-20 win over Washington. Newton now has seven rushing touchdowns, tying VINCE YOUNG (seven in 2006) for the most rushing touchdowns by a rookie quarterback in a season since 1970. This season, Newton has eight passing touchdowns and seven rushing TDs. He is the first player in NFL history with at least seven passing and seven rushing touchdowns in the first seven games of a career. 7. Detroit wide receiver CALVIN JOHNSON had five catches for 115 yards with one touchdown against Atlanta. Johnson now has 10 TD catches this season and is the second player to have at least 10 receiving touchdowns through his team’s first seven games of a season since 1970 (RANDY MOSS, 10 in 2007).